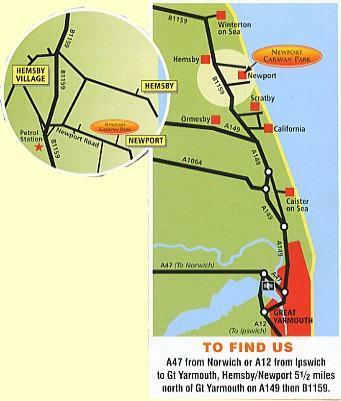 Newport is half a mile from the village Hemsby, 500 yds from a sandy beach and 5 1/2 miles north of Great Yarmouth. The Norfolk Broads offer excellent fresh water fishing and boating one of the main centres being Potter Heigham some 5 1/2 miles from Hemsby. 'Day' boats may be hired by the hour or day from Potter Heigham and other centres such as Wroxham together with Broads water tours. Horse riding and golf are available at Caister which is between Great Yarmouth and Hemsby. Great Yarmouth has everything the holidaymaker wants, Sea Life Centre, Pleasure Beach fun fair, waterways, summer shows, bowls, tennis etc. Norwich 20 miles away and the surrounding area together with the North Norfolk Coast are ideal for those wishing to tour or explore.